Constructed and independently tested to perform under extreme sea conditions. 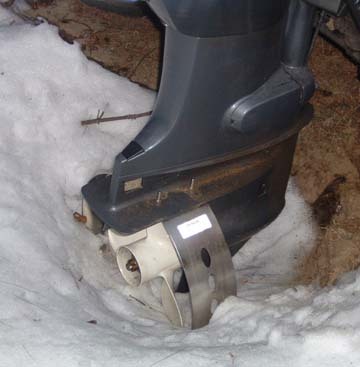 Propeller or prop guards may become mandatory in the U.S. Be safe, be proactive, act now. Used by Coast Guards and Military worldwide. Don't compromise with other guards that bend, flex & break. Go with our products that will last forever. These are the highest quality guards on the market. Has one prime function: SAFETY. For water skiers and water sport enthusiasts, the Safety Guards can help be a "lifetime" of safety and proactive protection against accidents, injury, death and/or lawsuits. Insurance companies love this product and so will you! They offer protection for swimmers, water skiers, divers and other persons in the water around the boat. They also help protect sea-life such as manatee’s, seals and other sea-life. 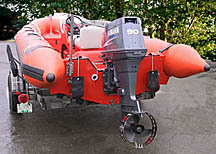 A must for rescue boats, police and fire department inflatables, rental house boats, boat rental fleets, pontoon boats and many other applications. Protect yourself, your family, your friends, your business, and your assets now! Designed for the serious boater or fisherman. Will protect the propeller and skeg from damage in shallow water. Ideal accessory to keep lines and downrigger wires away from propeller. 4" wide stainless steel band complete with "Pressure Relief Ports" to enhance performance. 10 gauge heavy duty protection for propeller. Also increases efficiency of propeller. All stainless steel mounting hardware included. Entire unit electropolished for extra long life. Nine sizes from 7" to 16" propeller diameter. Review important SIZING INFORMATION below to determine the size of guard you require. Then choose that size from the the 2 categories below to see size options for your engine. Propeller line guards in several sizes to protect props from damage and keep fishing lines out of the prop. Propeller guards in several sizes for protecting swimmers from injury, sea life from injury, and props from damage.